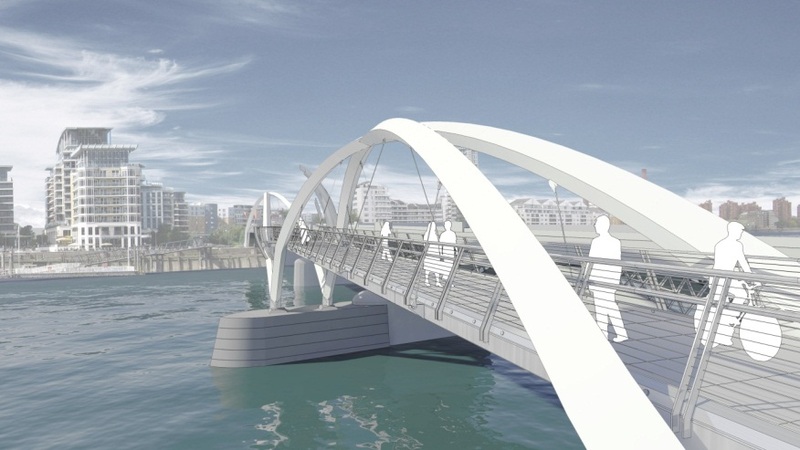 Following nine months of consultation and design development, a design for a new foot and cycle bridge across the Thames has been submitted for planning consent. There has long been a desire for improved river crossings in west London although the numerous constraints have, until now, prevented a design being developed. Known as the Diamond Jubilee Footbridge, this new crossing will provide a key connection taking cyclists and pedestrians between Chelsea Harbour and Lombard Road in Battersea. The new bridge is located next to the Grade II listed Cremorne railway bridge which meant extensive consultations were required with English Heritage and Network Rail as well as the three local councils and neighbouring property owners. The close proximity of Battersea Heliport also imposed restrictions on the design and on the construction methodology. The bridge is the concept of architect Chris Medland of One-World Design with Expedition Engineering responsible for the structural design of the superstructure. Beckett Rankine prepared the foundation pier designs, managed the hydrodynamic assessment, prepared the Navigational Risk Assessment and carried out the marine regulatory consultations. While funding for the £22 million project is not yet fully secured obtaining planning consent will be a major step on the way to delivering this delightful new river crossing. Posted in News and tagged with UK News .